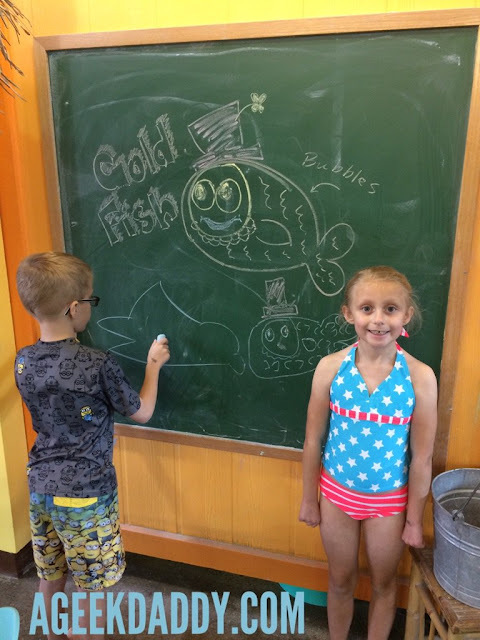 We always arrive a half hour early to my kids swimming lessons at Goldfish Swim School so they are ready to go and don't miss a minute of class. My kids are never bored showing up early though because there are plenty of fun things to do outside the pool. 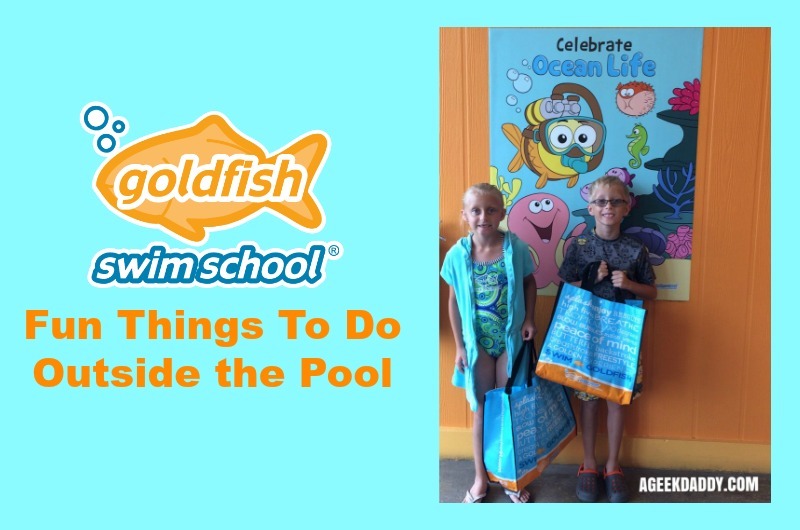 Just another reason we've had a golden experience at Goldfish Swim School! The twins love to draw on the large chalk boards in the waiting area and sometimes I have to pull them away so they aren't late for class even though we arrived early and are only a few feet from the pool. They've really created some impressive drawings and the kids enjoy having the feeling they are helping decorate the place. Plus there are always activity sheets and coloring pages tied to the swim school's monthly theme available to keep children occupied. July's theme is "Celebrate Ocean Life." Rushing out the door and forget to give the kids something to eat before leaving home? 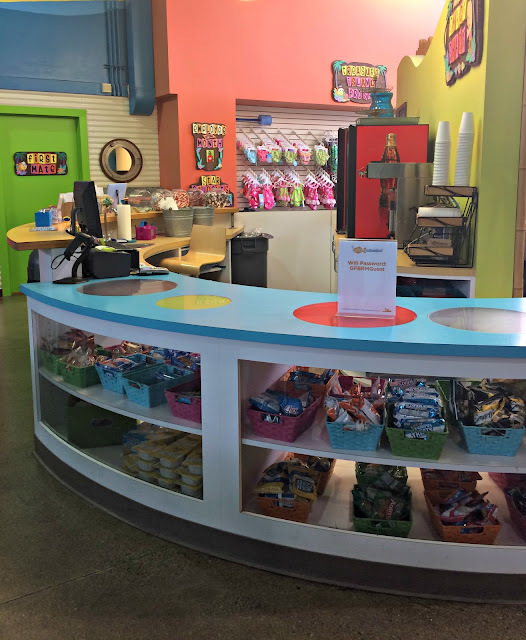 Goldfish Swim School stocks a snack bar filled with affordable family-friendly items to help energize kids for their swimming lessons or re-fuel after class. Items to eat range from bowls of Cheerios to Rice Krispy Treats along with juice or bottled water to drink. They have coffee as well to help perk up moms and dads. 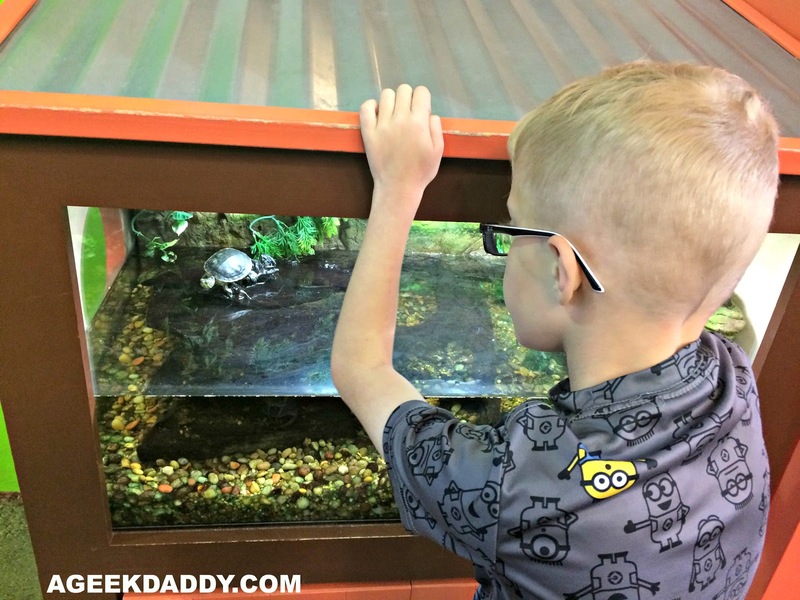 My son can't go into class without checking out the pair of turtles and tank of goldfish that are on display. It is amazing how as many times as we've been there he is always fascinated with checking them out. Have to admit I always go over and look at the turtles too whenever we're at Goldfish Swim School. If you have toddlers and preschoolers there is also a play area stocked with games and toys to keep the little ones amused before they get in the pool. As part of the theme of the month program, they also give out to students a small toy or puzzle that ties into it. They really do a nice job with these giveaways and my kids are always on the lookout for them. After class is over don't forget to grab a FREE balloon to take home with you! 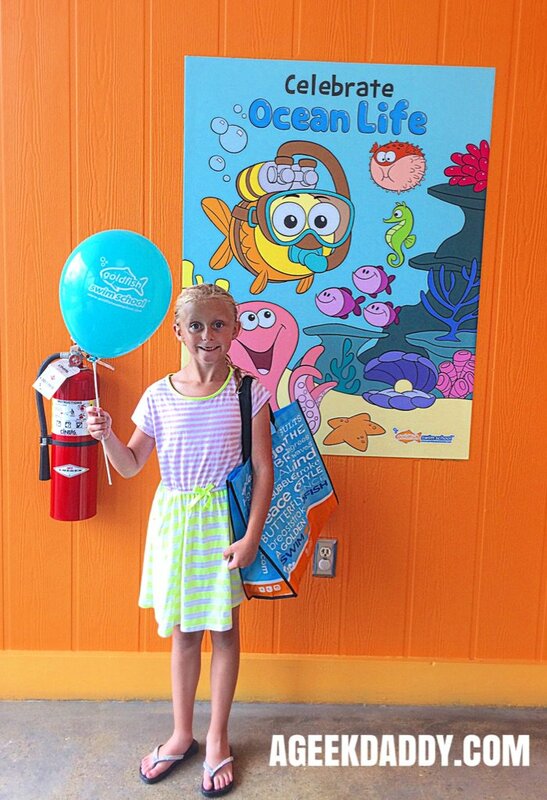 At Goldfish Swim School your kids are sure to have fun in and out of the pool. For more information, please visit goldfishswimschool.com. You can also follow along with my family's fun times on Twitter and Instagram. These ideas sound so fun! I'll have to pass this on to my sister in law for ideas! That looks like so much fun! My family and I love nature and wildlife. 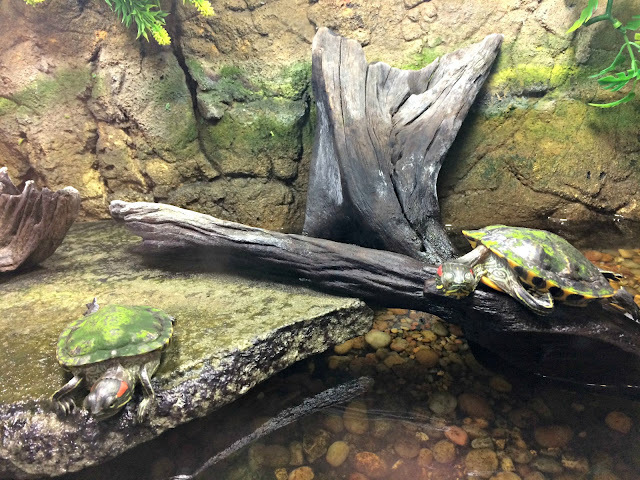 I know my kids would love checking out the turtles. Wow! My kids swim lessons where nothing like this! This is awesome! I would not want to leave! What a fun place! It's great that they offer activities that are not just about swimming, since people think of the pool first when they think of summer. What a fun little swim school! I love that there is an area for siblings to play while swim class is in session!! What a fun place to take the kiddos. Turtles always facinated me when I was younger as well. What a fun place for the whole family. I love that they offer a lot of activities. I think it's awesome that the kids can do other activities while they're there! Most swim schools would only focus on the pool and that's it. This is awesome! This looks like a wonderful place to take kids to learn to swim. I wanted both my girls to learn to swim, and now they are both on swim team. I feel like it is such an important life skill to have, both for safety and for fun. We are traveling to Mexico in the fall and I love that my girls will be able to snorkel and enjoy other watersports. I haven't taken my son to swim class yet. We probably should so that he can learn how to properly swim. He would love looking at the turtles too. We just started looking into a swimming school. Thank you for sharing this review. Looks great! I remember when my kids were little and went to swim school. Sounds like a good one! Oh wow that looks like such a fun place. Those turtles are so cute. My grand daughter is obsessed with turtles. that place looks like so much fun!!! I would love to bring my niece n nephew there! This place looks great! I think it is awesome how they have so much for the kids to do and they are encouraged to learn.